JD Consult is a multipurpose/Ecommerce Joomla template. It is entirely suitable for Ecommerce and multipurpose business website. It comes with multiple shop page layout and different pre-designed landing pages. It integrates with K2 and EasyBlog components for a blog, Acymailing for newsletter/email marketing and j2Store is for correctly manages your shop with ease. It built with Smart slider 3 pro and Quix page builder which allows you to create site designs from top to bottom. JD Consult offers 4 colours presets, 3 types of menus, rich typography and much more. Besides that, this super simple theme is fully responsive (Mobile Friendly) and cross-compatible with all the major browsers. JD Consult is fully compatible to any viewing device irrespective of size and is a kind of Joomla Template which works flawlessly on all commonly used browsers. Currently, JD Consult is on sale for $39 at JoomDev. With that, you will get future updates and 6 months support ftom the theme developers. You can also download the free version before you buy. Once your payment is complete your account is immediate active, this generally takes less than a minute to occur. JD Consult comes packed with quickstart package with demo data installer (Joomla 3.8, recover template, used extensions, demo content – all included). Once you install the quickstart, you’ll have a replica of the live demo. 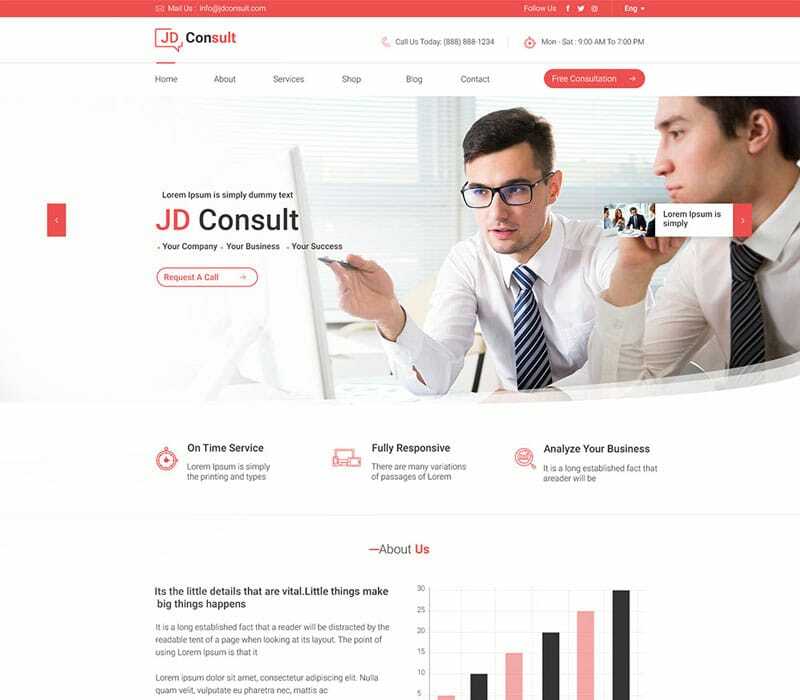 JD Consult is a beautiful and intuitive multipurpose Joomla template. This template has been designed to help you attract new visitors, promote your services, and grow your business.